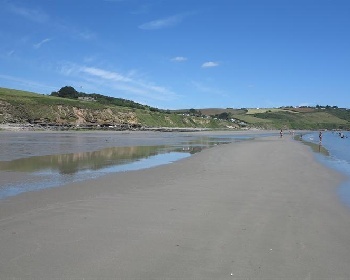 Carne Beach is the east part of a huge sandy beach about 1 mile long in Gerrans Bay. There is a slipway down to Carne Beach. Dogs allowed all year (on leads) at Carne Beach. Carne Beach is 10 miles from Truro and 12 miles from St Austell. Aproaching from the east or west on the A390 about 4 miles east of Truro turn onto the A3078 for St Mawes. Continue on the A3078 past Tregony and Ruan High Lanes and then turn left for Veryan (signposted to Veryan). At Veryan turn right (signposted to Pendower), then follow this road for about 2 miles and follow the road around a left bend (signposted to Carne Beach) and then follow this road down to Carne Beach. 1 car park at Carne Beach. Yes, in the Carne Beach car park.